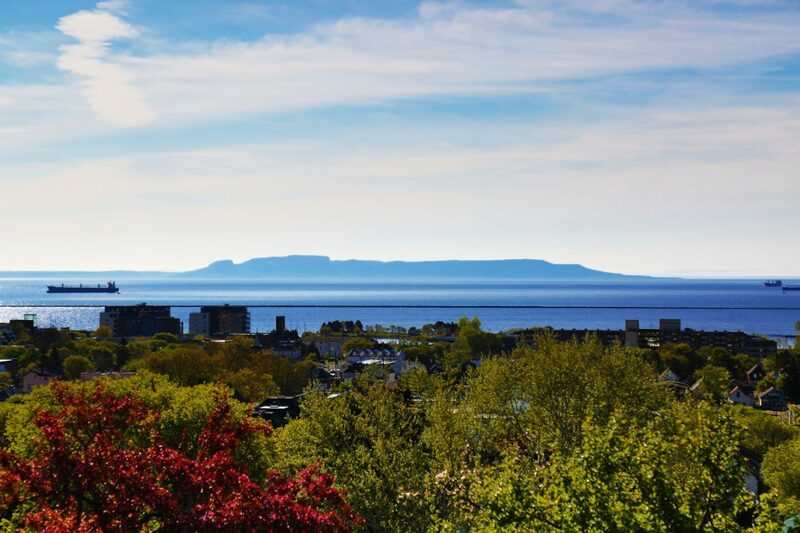 The view of the Sleeping Giant from Thunder Bay. Photo courtesy of Sean Proulx/CC BY-NC-ND 2.0. Thunder Bay’s former mayor, turning on his computer on May 23, raised his eyebrows. 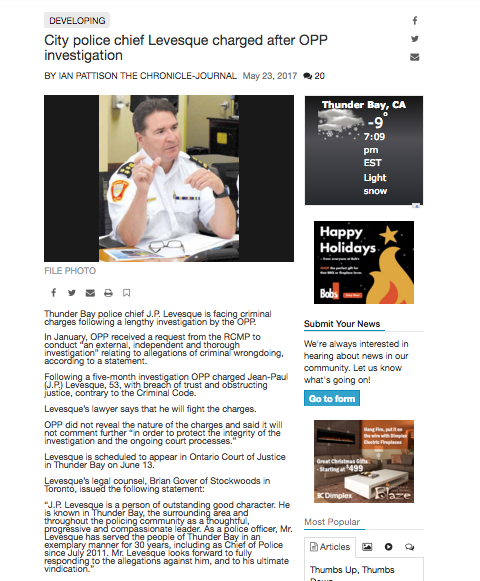 “City police chief Levesque charged after OPP investigation,” said the headline on the local paper’s website. The story was a brief — 356 words long. It’s very rare for a sitting police chief to face criminal charges, Ken Boshcoff knew. And the charges themselves, breach of trust and obstructing justice, seemed to suggest something serious. The update the next day, 225 words long, said that the city’s current mayor, Keith Hobbs, was somehow linked to the situation, with his name appearing in court documents. And then the matter didn’t come up again in local media for weeks. Boshcoff knows a lot about Thunder Bay, a city of about 100,000 with a major port on the Great Lakes. He was first elected as city councillor in 1978, then became mayor, then MP and then a councillor again until 2014. Boshcoff wasn’t surprised, however, that he had been so surprised — that something so serious could have gotten all the way to criminal charges with no prior inkling in the press, or that so little was explained afterwards. “The way journalism is now … they simply don’t have enough people on the assignment,” he said. There had also had been increasing signs that those in power, including Mayor Hobbs, had, “gotten accustomed to not being taken to task,” Boshcoff says. Decades of industry upheaval have hollowed out many of Canada’s small papers, with the process accelerating in the last couple of years. Last fall, the closure of three dozen community papers in one fell swoop led to a new flurry of thinkpieces: what happens when the local watchdog goes away? Canada already has an answer to that question, and it’s in Thunder Bay. To say the city’s local paper is declining would be an understatement. 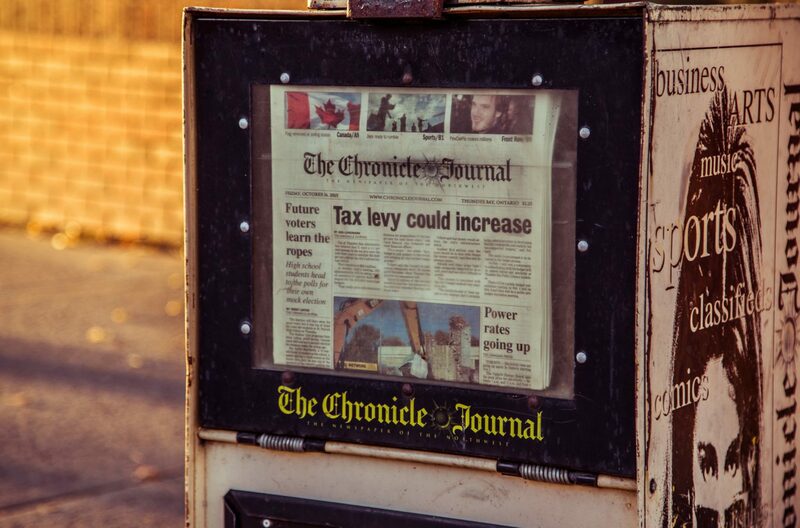 The Chronicle-Journal had no full-time local reporter on staff for more than a year recently, according to past and present staff, filling its pages largely with wire stories and blurbs written by its two photographers. The problems in Thunder Bay, of course, are much more serious than a political scandal. The local Indigenous community has come to distrust public institutions to the point that many people believe the deaths of several Indigenous youth, initially though to be suicides or accidents, are actually unsolved murders. 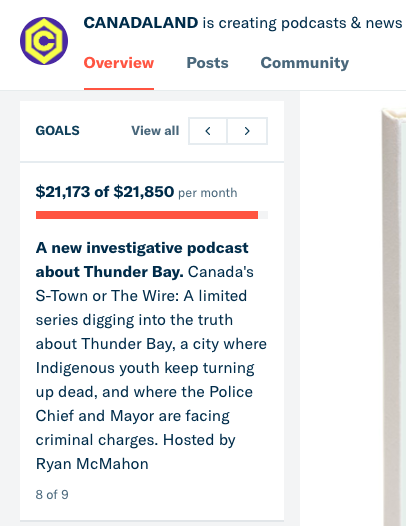 The journalism void has drawn national media to Thunder Bay, including a new Canadaland podcast promising to unravel the entire story. But more than retroactive answers, a few people like Boshcoff would like to know whether a healthier local media scene could have stopped the crisis from becoming so serious in the first place. A Chronicle-Journal newspaper box in Thunder Bay. Photo courtesy of Tony Webster/CC BY 2.0. On paper, Thunder Bay seems to have an adequate variety of media. The city of about 100,000 has a newspaper, two TV stations, three radio stations and an online news site called tbnewswatch.com. It also has a CBC bureau with 10 people contributing reporting, four of them full-time, and a single reporter for APTN News. But look closer, and there’s less journalism happening. All the properties other than CBC, the newspaper and APTN are owned by the same company, Dougall Media, and they share content. Perhaps most crucially, the understaffing of the newspaper has taken away a news mainstay that most cities rely upon. Normally, newspapers produce a greater volume of coverage than any other type of news outlet, says April Lindgren, a professor at Ryerson University who also leads a long-running research project tracking the state of journalism in Canadian communities. In the month prior to that vote, the combined Dougall Media properties produced the most about the election, with 76 stories. The Chronicle-Journal produced the second-most, with 61 stories. CBC produced 24 stories, according to Lindgren, who hasn’t yet published the analysis. From week to week, without the paper serving as the “keystone” outlet, each outlet tends to stake out its own top stories and cover them alone. The Dougall Media properties, for example, are are the only company that routinely has a reporter at city council meetings, says reporter Matt Vis, who works for that company. “There’s been multiple meetings in the past four or five months where we’ve been the only ones in council chambers,” said Vis. That tradeoff means that CBC Thunder Bay tends to get exclusives and to do many of the enterprise stories that a newspaper would normally do, especially in their coverage of Indigenous issues. 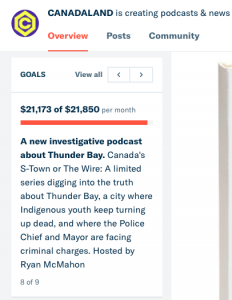 “Their coverage is the one that leads the pack,” said Toronto Star reporter Tanya Talaga, who published a book this year on Thunder Bay. Over the last year in particular, APTN News has also broken many significant Indigenous-related stories and sent additional reporters to town to cover aspects of the political scandal. However, just how much had fallen between those cracks of that system became clear in the summer, a few months after the police chief was charged, when mayor Keith Hobbs and his wife were also arrested. Then, court documents began to lay out links between those two cases and a third one which had also gotten barebones coverage. It is a tale that would take many inches of newsprint to explain in detail. A prominent local lawyer, Sandy Zaitzeff, had been arrested the previous fall on sexual assault charges. Hobbs, his wife and a second woman were accused of blackmailing Zaitzeff, in exchange for their silence over the sexual assault allegations. The accusations were laid out more fully in Levesque’s recent trial. A mutual acquaintance of Hobbs and Zaitzeff testified that he was asked to ferry a USB key with damning videos between the two so Zaitzeff would know “how much trouble he is in,” APTN reported. Zaitzeff’s trial begins this month, and Hobbs’ pretrial date has not yet been set. None of the charges against any of the people involved has been proven in court. The domino-like sequence of events that connected the three cases, court documents attested in July, had allegedly happened about nine months earlier. But there was a lot that could have been investigated in those nine months that was increasingly the subject of gossip around Thunder Bay. It was apparent that there was an odd, ongoing conflict and perhaps also a friendship between Hobbs and the lawyer, Zaitzeff; in late January, a couple of months after Zaitzeff’s arrest, a bizarre video had been posted on YouTube showing Hobbs and a drunk Zaitzeff together one night. Hobbs had threatened Zaitzeff with a lawsuit over video. The Chronicle-Journal did cover that threat in one story, then dropped the matter. A few months later, in May, court documents filed at the police chief’s arrest said charges concerned “allegations that (Levesque) disclosed confidential information concerning the city’s mayor,” the CBC wrote at the time. No story attempted to explain, however, what that confidential information was. 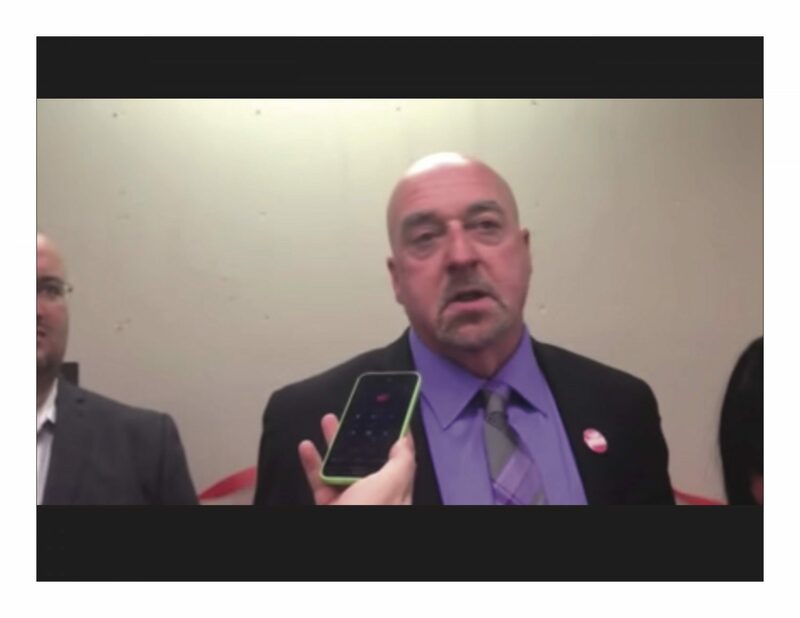 CBC Thunder Bay’s report on Keith Hobbs winning the 2014 mayoral election. Screenshot by J-Source. Keith Hobbs was first elected in 2010. The spring of 2012 was one of the first times that locals remember questions about his performance going conspicuously unanswered. Thunder Bay saw disastrous flooding that spring, and Hobbs left town to go to Superior, Minnesota for two-and-a-half days right as the crisis was building. People recall speculating on Facebook and in person, but media never seemed to ask where he’d been. “People were wondering where he disappeared to during the flood, which was a major event,” says Boshcoff. In the following months, a more serious question developed. The city came to face a $230 million class action lawsuit over the flood. The lawsuit was filed in September, 2013, and its local lawyer was Sandy Zaitzeff (he resigned from the case after he was charged with sexual assault). That meant that, to whatever extent Hobbs was in contact with Zaitzeff in his off-hours—such as their YouTube appearance—he appeared to outside observers to be fraternizing with someone in legal conflict with the city. Hobbs says he saw Zaitzeff “for a lawful purpose,” and he had, in fact, declared a conflict of interest around the flood lawsuit, since his own home was damaged, making him a potential claimant. He did notice that media never broached the subject of a conflict of interest over the lawsuit. “I’m not going to go into this, but I had clearance from our lawyer to speak to (Zaitzeff),” said Hobbs. “I know what conflict of interest is… people will get the whole story once it’s through the courts.” He added that he looked forward to being completely vindicated in court. To Boshcoff, media silence in those years was an increasingly disturbing sign that journalists were no longer sorting through the grey areas of grumbling and gossip, trying to decide when lines had been crossed. inquest into the drowning deaths of several Anishinaabe youths, the newspaper had fairly consistent coverage of the proceedings, often on the front page. But after the inquest there were additional similar deaths, and the fears of the local Indigenous community grew —that they actually involved foul play, and that the youth could have been targeted. As that theory began to get more national attention, in winter and spring of last year, and as local tensions rose, the paper’s coverage of police oversight consisted mostly of Canadian Press stories. Stories by its own writers skirted around the substance of the fears even in the most thorough articles. Some pieces reviewed by J-Source were made up almost entirely of police statements, published word for word. The only time the issue was addressed head-on was in letters to the editor. 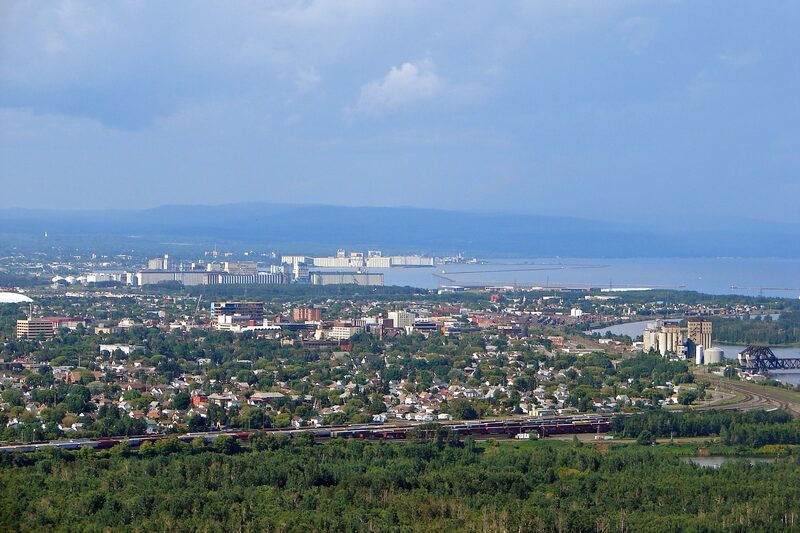 The skyline of Thunder Bay. Photo courtesy of P199/CC BY-SA 3.0. The Chronicle-Journal wasn’t always so scanty. In fact, it was one of the last Canadian cities with separate morning and evening papers until the two were merged in 1996. At that time, it was owned by the Thomson Corporation and had a weekday circulation of about 33,000, roughly double what it is today. Things changed four years later when the paper was bought by Horizon Operations, part of the media empire run by Conrad Black and his longtime associate David Radler. Radler eventually testified against his former business partner, served a short sentence in the same fraud case that sent Black to prison, and began re-carving a place in Canadian media. He remains the owner of the Chronicle-Journal through a privately-held, B.C.-based company, Continental Newspapers. Paul Winkler, who was publisher at a Kelowna newspaper when Radler bought it, said Radler was obsessive about making money in the 90s, believing he could nearly double that paper’s already-healthy profits — especially since he also owned its competitor, a move that turned out to be one of Radler and Black’s earliest deals in the pattern that eventually led to the American fraud case. In Thunder Bay, Radler’s ownership coincided with the advent of the internet and the declining ad sales that development brought for all newspapers. But he took an especially ruthless approach to staunching that financial bleeding, transforming the newsroom within a few years. Things changed fairly quickly. By about 2005, staffing had dropped sharply, mostly through attrition, the staffer said. “Money was the bottom line and it was like, okay, which departments cost money, as opposed to which department brings in revenue?” said the staffer. Employees felt their paper was a “cash cow” as Radler began to rebuild his media properties. By about 2010, there were fewer than five reporters, and staffing has since sunk even lower before rebounding somewhat. For all of 2014, the paper didn’t have a single full-time reporter in Thunder Bay, according to the three past and present employees at the paper contacted by J-Source. Photographers were expected to file four written blurbs with photos per day, said the two Chronicle-Journal employees who spoke to J-Source, and according to Vis, who was working at the time for a competing outlet. The paper’s readership is now going up, he said, and industry circulation records show that it has one of the best market penetration rates among papers in similarly-sized cities. Part of the change at the paper around that time was in tone, according to John Webster, the paper’s union representative at Unifor. In 2013, the paper stopped paying some columnists, replacing them with unpaid “community journalists,” said Webster. “The (volunteer columnists) seem to rely a lot on knitting or cats,” said Webster. A newspaper employee said “there’s a big push on to have what they call ‘Your News’… all the happy-happy-joy-joy events,” such as hockey tournaments and fundraisers. The mood in the newsroom is grim, and turnover is extremely high, further hurting the ability to dig into stories, said the employee—even though there are people on staff who used to do this. “That’s why you became a reporter,” the employee said. TBnewswatch.com, with four reporters churning out about 10 to 12 stories per day, is more similar to other cities’ newspapers, Vis said. But for every outlet, the small media market is missing some other ingredients that would have helped coverage of the political scandal, he said. He believes no local outlet other than CBC has a lawyer on retainer, which makes them less likely to publish touchy information. (Harris confirmed that while the Chronicle Journal has a longstanding relationship with a law firm, the firm is not on retainer). Vis believes most local media were aware the mayor was under police investigation long before charges were laid, for example, but no outlet took the legal risk of breaking the story. Vis, who was at the Chronicle-Journal when some of the information around Hobbs and Zaitzeff began to circulate, remembered the “risk versus reward” discussion—whether, for example, it was even worth paying to consult a lawyer. “They didn’t really know what to do with it,” he said. “Initially there was a wait-and-see approach,” said a second member of the paper’s staff, who was also present during those discussions. And aside from publishing what had already come to light, trying to uncover the roots of the growing scandal was out of the question, said the staffer, who asked not to be identified. Harris said he was happy with the paper’s coverage of the scandal, and that it was handled “appropriately,” without delving into speculation or gossip. Regarding Hobbs and Zaitzeff, “we did have some information regarding that sort of weird relationship, but it was minor because that’s what it should be,” he said. 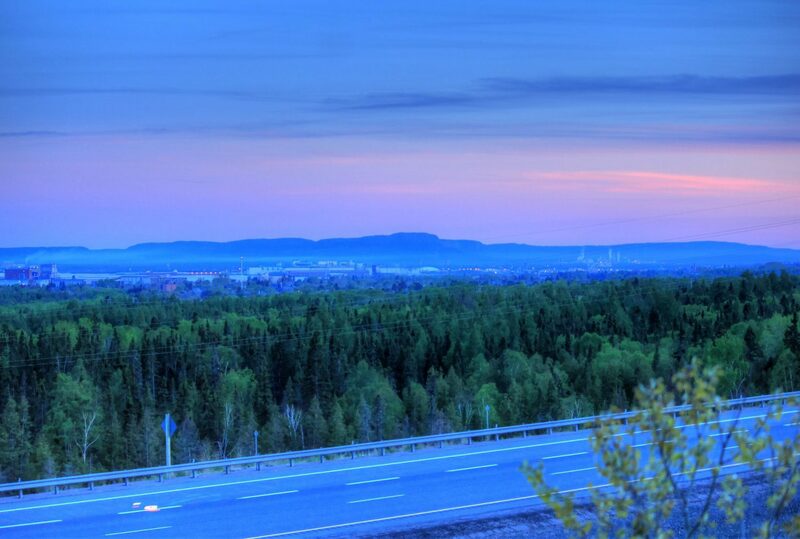 Thunder Bay from Terry Fox Lookout. Photo courtesy Good Free Photos/CC0/Public Domain. comedian working on the podcast, said he’s heard a lot of complaints about local media. “I’ve heard over and over again that one family own most of the media in Thunder Bay,” he wrote in a message to J-Source. One bright spot is a new project from TVO which has established four new “journalism hubs” across Ontario, one of them in Thunder Bay. And national Canadian newspapers appear to have covered the city at a more or less steady pace over the past three decades. A brief news analysis by J-Source tracked stories by Ontario’s biggest newspapers that touched on Thunder Bay’s city council, finding those mentions haven’t dropped over the last 30 years. But recently, national newspapers have stopped serving Thunder Bay readers, at least in print. In 2012, the Globe and Mail ceased service to the city, with publisher Philip Crawley saying it was too far to be cost-effective. According to a spokeswoman for the National Post, the paper was distributed there, though never as home delivery, until 2008. One longtime resident said it’s hard, as a reader, to put it all together. Gail Jones, 59, says she does regularly read the Chronicle-Journal, but much of the important news tends to come through “hearsay” or TV news, and lately that hasn’t been enough. “I don’t know how it’s all related. I guess it’s about this lawyer, then it’s about the police chief, and it’s all together in one, eh?” said Jones, who runs a hostel.